"Belinda Anne Micucci and Jayne Carol Lavigne, Westbrook College, Class"
Westbrook College students Belinda Anne Micucci and Jayne Carol Lord, Class of 1974, were Day Hops. Belinda Anne was a Medical Assistant major; for her senior class candid photo, which appeared in the 1974 Tower Yearbook, she wore a light colored, long sleeve dress. Her hair was long and parted in the middle with bangs over her forehead. Jayne Carol was a General Studies/OP major; for her senior class candid photo, she wore a long sleeve blouse and brightly figured slacks. Her dark hair was parted in the middle, and hung straight and long reaching to her waist. 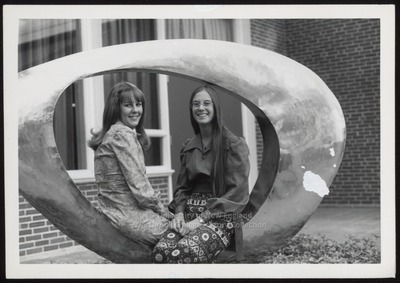 The young women sit, facing each other, within the Alexander Patio sculpture which is in memory of Victoria Hourlin (1948-1967), class of 1968. Vicky had a history of heart disease and died on a Monday morning during class in Moulton Theater. The sculptor, Clark B. Fitz-Gerald, stated that the elliptical form of the sculpture represents eternal life.